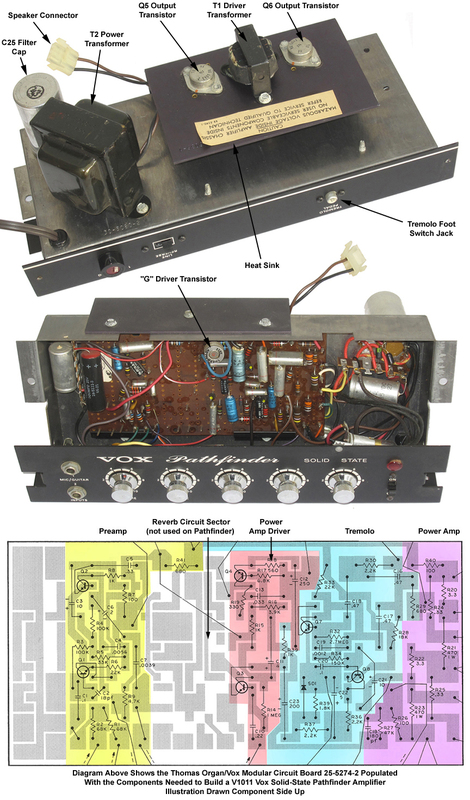 "A Look Under the Hood"
The V1011 Pathfinder was the entry or "student" level solid state amplifier from the Vox division of the Thomas Organ Company of Sepulveda California. It was offered from 1966 through 1971. A single steel chassis housed the all of the preamp, power amp and power supply circuitry for the Pathfinder amp. The chassis was comprised of three pieces: the chassis pan, the control panel and the power amp heat sink. The stamped and formed steel chassis pan was the backbone of the chassis. It housed the 25-5274-2 printed circuit board assembly. It also supported the T2 power transformer and the 2500 uf main filter cap. 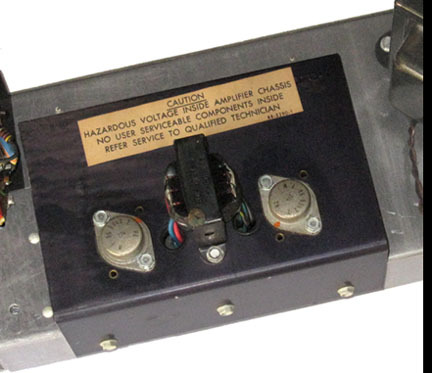 This basic chassis pan was also shared with all models of the solid-state Pacemaker, Cambridge Reverb, Vox Berkeley II, Berkeley III and Vox Scorpion amplifiers. controls, jacks and switches. It was fastened to the top of the chassis pan with two machine screws. The third part of the chassis was the power amp heat sink. The germanium output transistors and the T1 power amp driver transformer were mounted to the power amp heat sink. The power amp heat sink was suspended beneath the main chassis to facilitate air circulation and fastened to the pan with three machine screws. 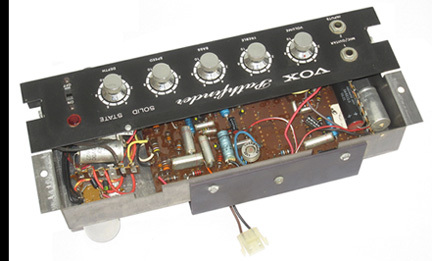 In late 1965, faced with the task of rapidly developing an entire range of solid-state U.S. Vox amplifiers, Thomas engineers aimed for manufacturing efficiency through modular construction and standardization. This style of construction allowed electronic sub-assemblies to be shared by multiple amplifier models. Thomas Organ engineers devised one modular strategy for building their higher powered solid-state guitar amps and a second modular strategy for their smaller solid-state guitar amps. For their larger amps, Thomas developed a universal preamp printed circuit board (PCB) that would form the basis for a modular preamp and control section for their higher powered amps. This circuit board was given the Thomas part number 25-5222-2. Thomas then developed 30, 60 and 120 watt power amplifier modules to combine with their new universal preamp section. When the universal preamp section was combined with the 30 watt RMS power amp module, the Viscount and Buckingham amps were created. When the preamp section was combined with the 60 watt RMS power amp module, the Royal Guardsman and Westminster arrived. Adding the 120 watt RMS power amp module to the universal three chanel preamp section formed the Super Beatle. Thomas Organ then aimed their efforts at an efficient modular strategy for building their smaller amps. Thomas developed a single printed circuit board that would be used in the proposed solid-state Pathfinder, Pacemaker, Cambridge Reverb and the Berkeley II amplifiers. Given the Thomas part number 25-5274-2, this single circuit board consolidated all of the preamp, tremolo, reverb and power amp circuits onto one circuit board. The Pathfinder offers an excellent example of how this modular construction technique was implemented. The Pathfinder did not include either MRB or reverb. The modular design of the 25-5274-2 PC board allowed the electronic components related to MRB and reverb circuits to be omitted. The reverb and MRB sectors of the modular PC board were empty (see photos and diagram above). It is also worth noting that Thomas Organ designed some unused circuit traces onto one end of the 25-5274-2 PC board. I suspect that this area of the board might have been under consideration for the future addition of a "Distortion Booster." The unused area of the 25-5274-2 PCB resembles the individual Distortion Booster circuit board (Thomas part number 25-5277-2) installed in the V1141, V1131, V1151 and V1121 preamps. Several of these unused traces were adapted for use in the E-Tuner circuit that was added to the V1022 Pacemaker and the V1032 Cambridge Reverb in 1967. The power supply for the V1011 Pathfinder utilized a full wave rectifier using two diodes and a power transformer with a center tapped secondary. Primary DC smoothing was accomplished by a large, vertical 2500 uf filter capacitor. Two additional 500 uf capacitors provided additional smoothing. The main supply voltage was 31 VDC but two series resistors in the power supply provided additional power taps at 27.5 and 18 VDC. The 12 watt power amplifier circuitry for the V1011 Pathfinder had two stages: driver and output. Power Amp Driver Circuit - The driver circuit included two transistors and a driver transformer. The power amp driver transistor (Q4) was designed to increase the gain in the preamplifier audio signal. The factory replacement part number for this transistor was 86-5075-2, but Thomas often refered to this transistor simply as "G." It was housed in a TO-3 style "top hat" case. As this part is susceptible to heat related failure, Thomas added cooling fins to the transistor (see circuit board photo at top of page). The industry standard equivalent part number for this silicon transistor is 2N2219. The output from the driver transistor was sent to the driver transformer (T1). The driver transformer served two roles. It acted as the phase splitter, sending one half of the audio wave to each output transistor. The driver transformer also isolated the output transistors from spikes coming from the preamp circuitry. Power Amp Output Circuit - The power amp output stage of the V1011 Pathfinder amp included a pair of germanium output transistors in an OTL (output transformerless) circuit. The output transistors and the T1 driver transformer were mounted to an "L" shaped steel heat sink that was suspended beneath the chassis pan to facilitate cooling. The commercial use of germanium transistors dates back to the mid 1950's. While germanium transistors were dominant in the design of solid-state devices for the next ten years, dependability was always an issue. They were especially prone to self destruct if they became hot. Early Motorola auto radios equipped with germanium transistors were known to suffer heat related failures in cars when exposed to nothing more than the summer sun with the windows closed. Given this issue and considering that the solid-state Thomas Vox amps were designed in late 1965, it seemed a curious choice to include germanium output transistors in some of their circuits. By this time, stable and dependable silicon transistors were commonly available. adaptions of the power amp circuitry used in Thomas organ consoles. The power amp circuit designs used in these organs could easily be several years old, developed prior to the arrival of silicon transistors. Incorporating these pre-existing power amp circuits into the lower powered U.S. Vox amp models (Pathfinder, Pacemaker, Cambridge Reverb, Berkeley II, Berkeley III, Viscount and Buckingham) would save developmental time and engineering costs for Thomas. The factory service manual for the V1011 Pathfinder amp offered 86-5090-2 as the factory replacement part number for the germanium output transistors in these amps. These internal Thomas parts numbers became meaningless after Whirpool closed the Thomas Organ parts warehouse in 1979. However, matched pairs of replacement germanium output transistors for the Pacemaker are still available from NTE Semiconductors under their part number NTE-121MP. Search the web to find an NTE dealer near you. A one button foot switch was included with the Pathfinder amplifier. It controlled the tremolo effect. It connected to the Pathfinder via an RCA plug. What Year Was My Pathfinder Built? After looking at hundreds of Thomas amplifier serial numbers, I have come to the conclusion that the first digits appear to provide a clue to the year the amplifier was produced. Serials starting with "9" were from the first full year of production, 1966. Those starting with "I0" or "10" were produced in 1967 while those starting with "I1" or "11" were built in 1968. Following this same pattern, a serial starting "I2" or "12" indicates 1969.